The girls in our family pack up and head to the beach for a week every Mother's Day. my aunt and cousin too. All us girls at the beach, it's such a special tradition. We play games, watch movies, tell stories, dance, eat and eat, laugh and laugh, go for runs, walk on the beach, lay out by the pool, hop on tubes to mosey down the lazy river pool...it is SO much fun! This year Tropical Storm Ana came in for the first couple of days of our stay and thankfully when she left the skies were clear and the temperatures perfect for the rest of our week. After the storm passed, my daughter and I went for a walk on the beach hoping to find some sharks teeth and pretty shells. 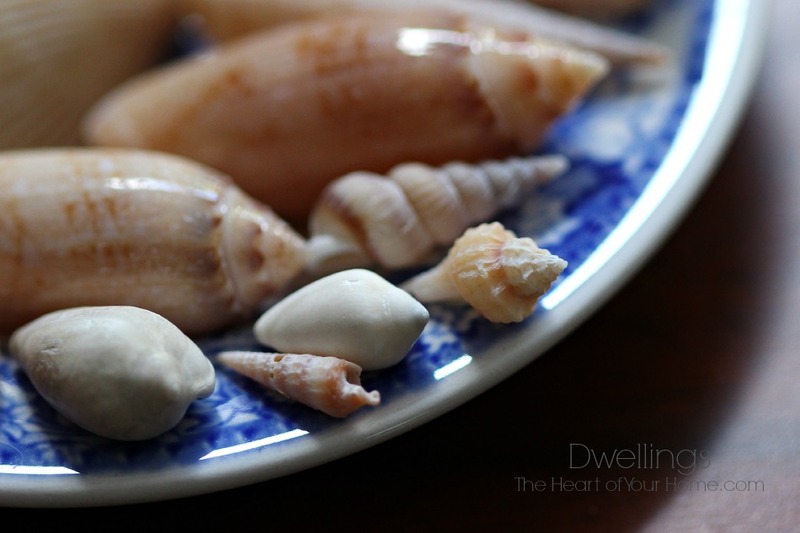 We didn't find any sharks teeth, but did find some of the tiniest seashells I have ever seen, so I brought them home. Placing the tiny shells in a measuring cup with hot water and a little dish detergent, I let them soak a while and would then give them a rinse. 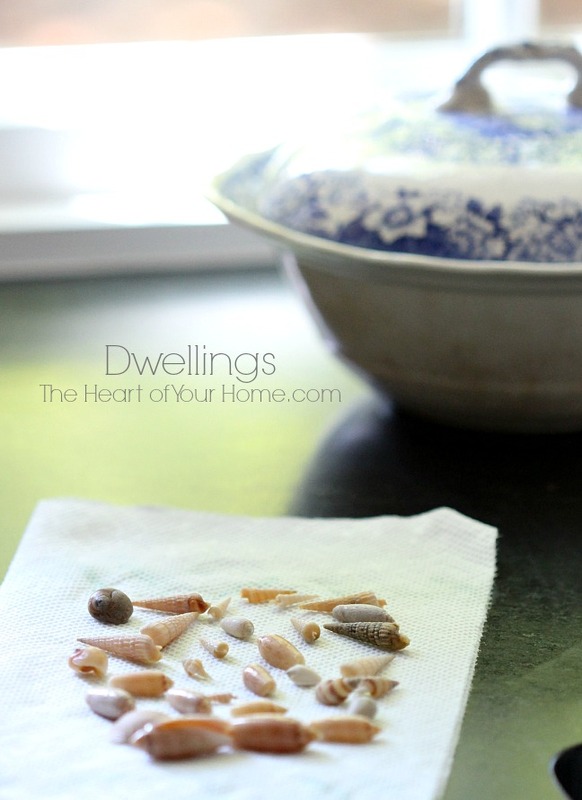 After repeating the process several times, I placed the seashells on a paper towel to dry. I was so surprised to find such small shells that weren't broken and were pretty too. It's hard to tell in this picture, but this is a dime. 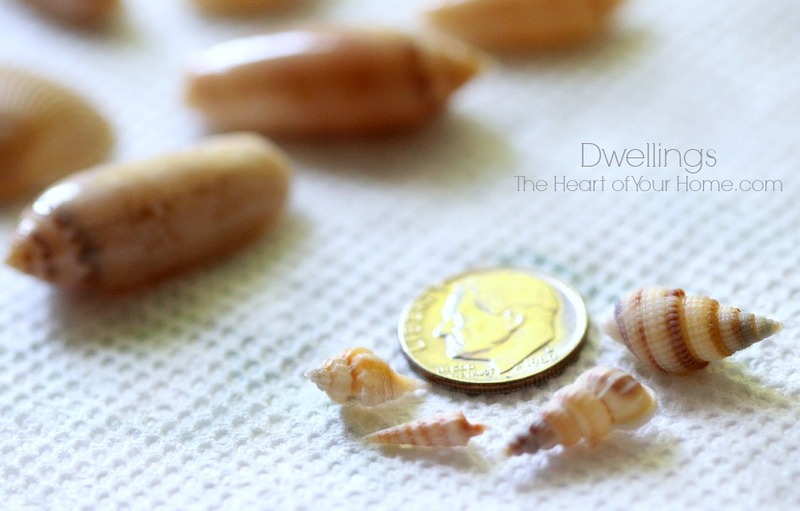 I placed it by these shells to help show how small they are and these aren't even the smallest ones. These two are even smaller. Years ago I purchased three Girl at Well Spode dishes that are about 3" in diameter; a black and white, red and white, and a blue and white. 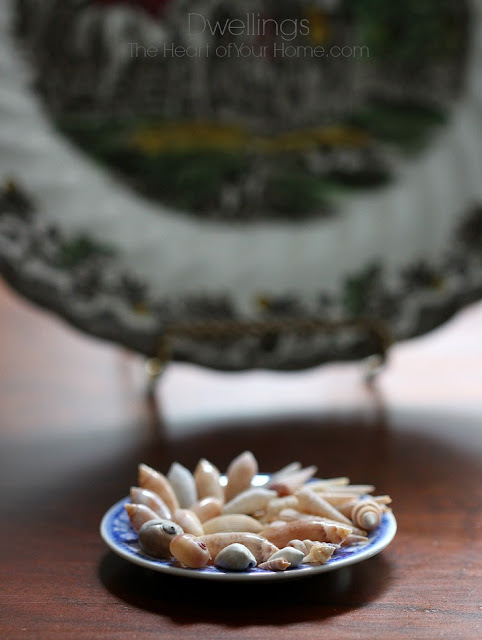 I decided to use the blue and white dish to display these tiny seashells. I took this picture to give you a better idea of how tiny this dish is which really shows how tiny these shells are. Do you see the dish on the table? There are just enough seashells to completely cover the dish. There was a lot of sand in these seashells. During the several washings there was grain upon grain of sand rinsed away. 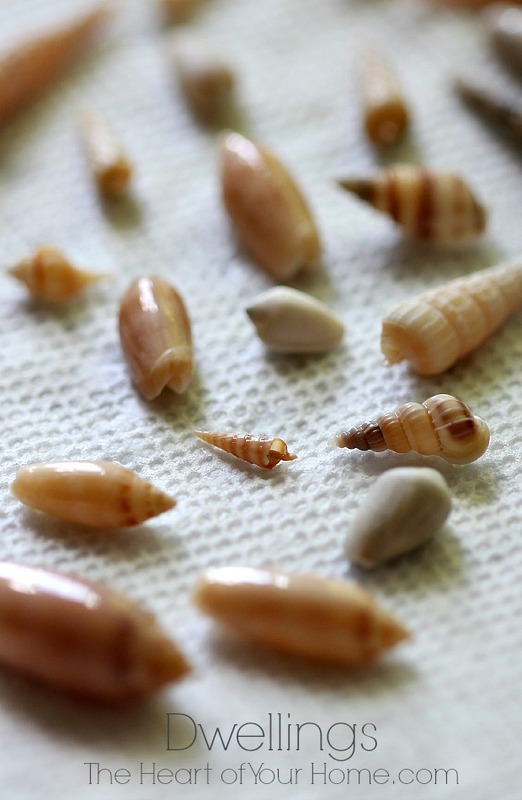 These shells are tiny but sand is much, much smaller. they would outnumber the grains of sand..."
To be confident of God's presence and love for us we need only view our surroundings. What tiny collections do you have on display? What a beautiful collection of shells. We are at the beach and I know what I'm going to be collecting the weekend for my table! Happy weekend!! How tiny! Beautiful things come in small packages. What a sweet reminder of His thoughts! Isn't it precious to think that He is thinking of us like that? Beautiful post, Cindy! It sounds like you all have a wonderful time on your annual girls' retreat. Those little seashells are precious. We manage to find some that size when we go to our beach house, but they're not always whole like yours. The way you've displayed them is just charming!! Believe it or not, I have three of those little plates too; they came with my collection of Staffordshire "Liberty Blue" ironstone. When I looked them up online, they referred to them as coasters, and they are about the right size for coasters. I plan to show them for the Fourth of July. I would love to see the pattern on yours; I bet it's lovely. 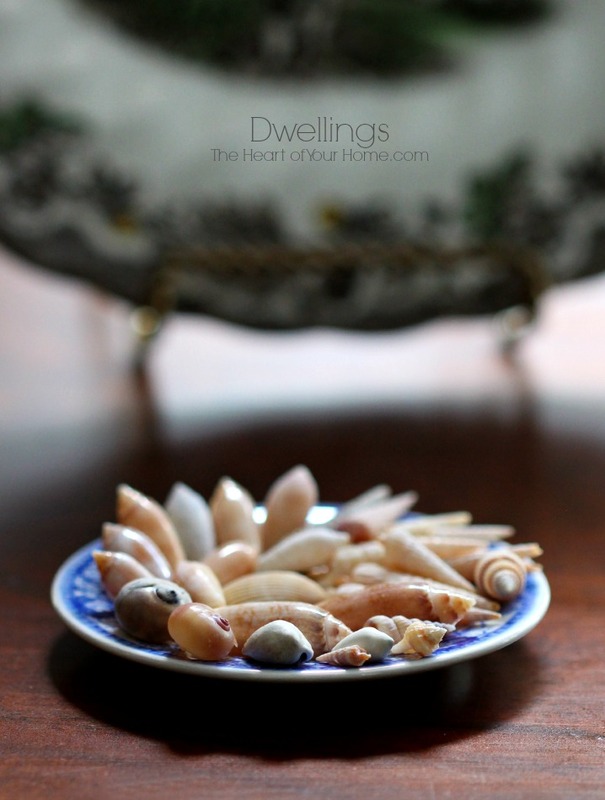 What a great idea to display your tiny shells this way! Thanks for sharing, Cindy, and have a great weekend! What a wonderful tradition you girls have! Love it and your collection. How pretty, how you have them arranged! Oh, my goodness, I have that exact table and I love it. 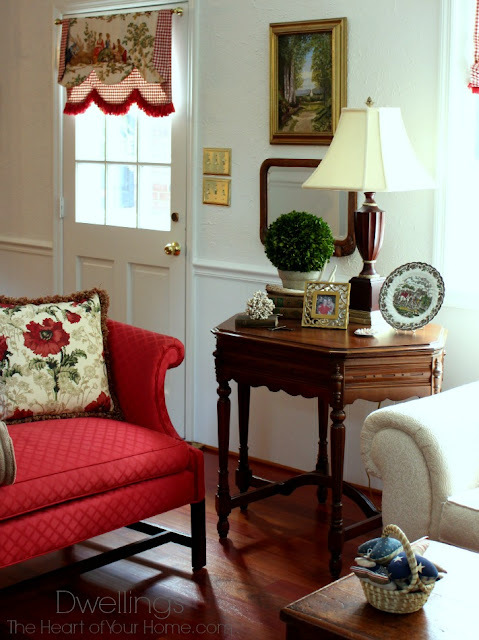 I bought it at an antique shop about 8 years ago and just had it refinished to get it in pristine condition for our new house. I do not presently have any tiny collections but I sure do like yours. Happy weekend! 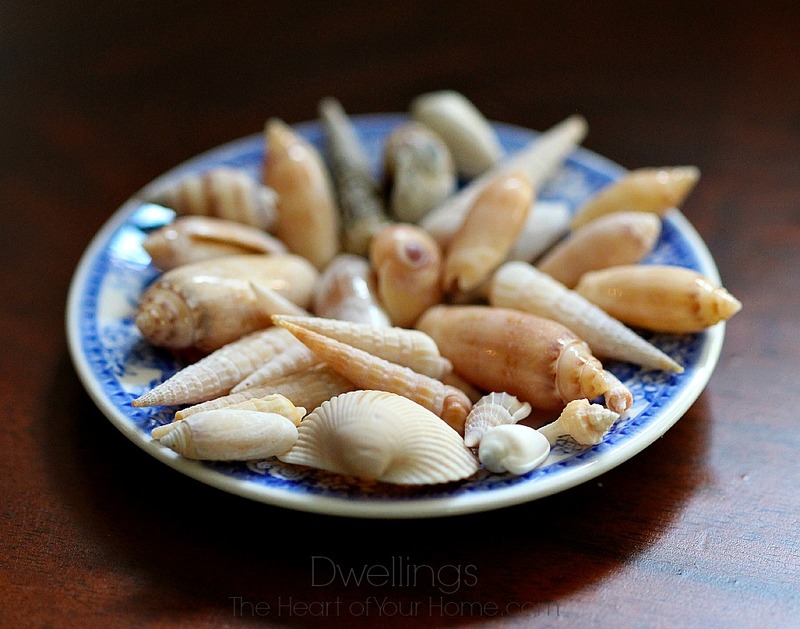 That is wonderful that you girls in the family can all do that...and that is a great collection of shells, too. Aren't those fun and great remembrances of your vacation time? 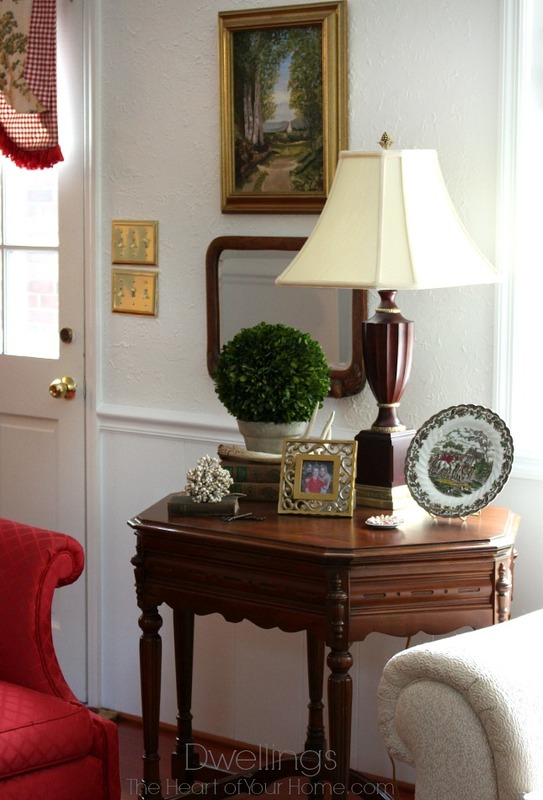 That is a really sweet old table the "shell plate" is sitting on. I really enjoyed this post. I can't believe how small those shells are. I have no tiny collection but yours are special. Love that you have a tradition with all the women and girls in your family. So glad that you had a wonderful time. 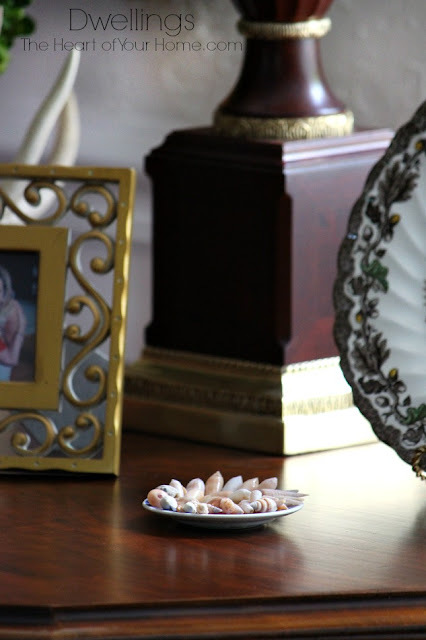 beautiful verse, shells, dish, and what a precious tradition you ladies enjoy. your photos are amazing, Cindy! 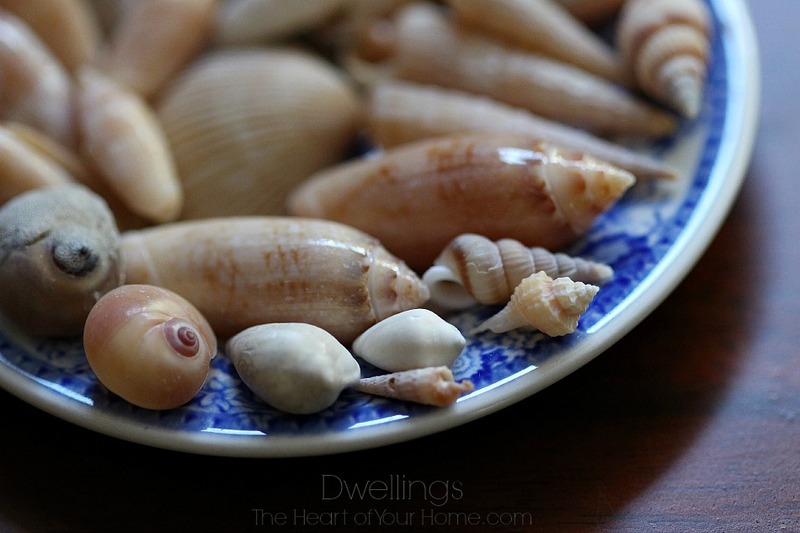 Those are some teeny tiny shells and you did a fantastic job with the macros! What a nice post! We live near the beach in Baldwin County, Alabama, and I am guilty of overlooking these seemingly insignificant tiny treasures that are all around us...maybe because they are so plentiful here. Anyway, this post give me a new appreciation for the tiny gems. Guess what I'm going to be searching for now? Beautiful idea putting them in the tiny dishes! What a pretty little collection Cindy...they look so pretty on the blue and white dish! Happy Weekend! I enjoyed seeing your charming shell display. Your olive shells are so shiny and perfect and the teeny augers are fun to find, too. I am always on the lookout for them when we go to Sanibel Island, FL. 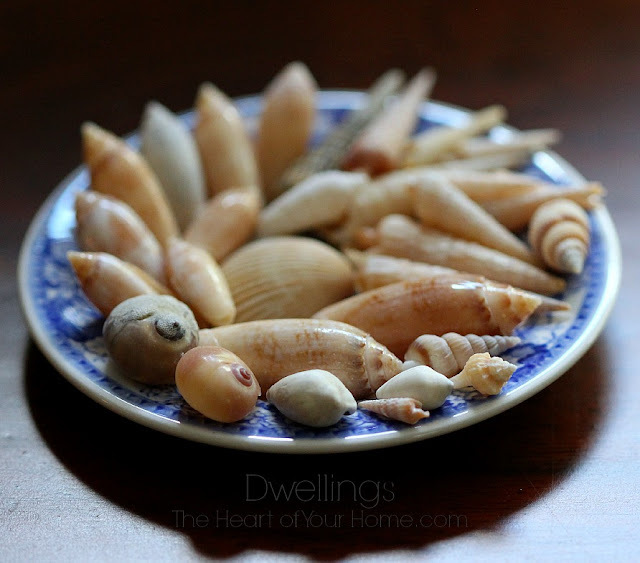 Your arrangement is lovely and inspires me to get out some of my little shells and create a similar one right now--it'll be the perfect place to showcase my wentletrap, a very favorite tiny shell of mine. Thanks for sharing your shell display idea! Oh my goodness! 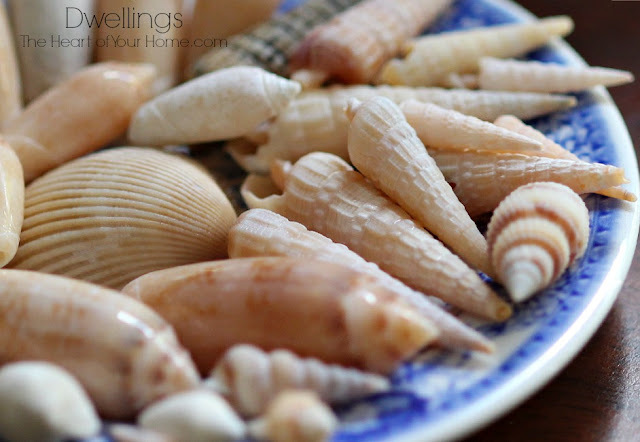 Those tiny seashells are so pretty and perfect. I've never seen any that small. You're right that it's a wonder that they haven't been broken. I like how you displayed them on that pretty little dish. It's like a little surprise waiting to be seen. 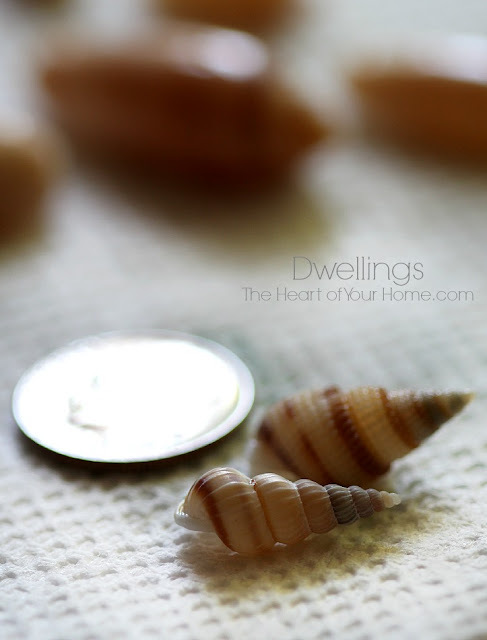 Cindy, wonderful photos of your tiny shells! They look so pretty sitting on your blue and white Spode plate.